I have read this book 11 times. It's not because of my faulty memory (although I do have one), it is because this is my favorite fiction book of all time. The shape is unusual for a novel - it is not told in one voice or from one point of view. At times there is an omniscient narrator and at others it is told in the first person. It is the story of the journeys of three people back to the landscape of family. Sometimes free verse, sometimes standard prose, always poetic. Keri Hulme plays with the shape and feel of words themselves, giving the book a sensory quality not usually found just by reading. I do not want to give too much away because I feel that discovering this book is sort of like going on an amazing drive through beautiful country - just around the next bend there will be something wonderful, but each person will be struck by different things. For those who don't speak Maori ( myself included), she keeps a handy glossary at the end of the book for the phrases that are thrown in occasionally. An original, personal and visceral novel, which for me is the kind of book that justifies the existence of the Booker Prize. The surface story is about the interactions between three difficult and damaged people, but there is a lot more to it than that - plenty of Maori culture, mythology and language (fortunately most of the latter is translated in the glossary) and a mixture of first and third person narrative voices including quite a lot of poetry. That may sound difficult, but the core story is quite gripping , though I must admit that I didn't try to follow everything. Hulme's introduction says that it started as a short story, but the finished novel is much more than that.At the centre of the story is Kerewin Holmes, whose character must be at least slightly autobiographical. She is an artist of mixed European and Maori heritage, estranged from her family, who leads a self-sufficient and independent life in a tower she has built for herself on the New Zealand coast. Her life is disturbed when she finds a mute boy with an injured foot in her tower. The boy is Simon (or Haimona), who turns out to be a survivor of a shipwreck in which his parents are believed to have died. The third character is Joe, who found Simon and adopted him with his now dead wife. Both Joe and Kerewin are heavy drinkers. The story concerns their interactions, conflicts and culture clashes.The story touches on some difficult themes, particularly Joe's relationship with Simon, which mixes extreme physical violence with a love that Simon needs more than anything else. Kerewin is asexual and dislikes physical contact, she is also fiercely independent. Part of the story involves the mystery of Simon's background - for example it is known that he already bore the scars of physical abuse before his adoption. I won't say too much more about the plot - I'm not sure I entirely believed the happy ending but it occupies such a small part of the book that it almost feels like an afterthought.So a very interesting book, a little flawed but probably very memorable. I don't know why it took me so long to get round to reading it, but I would certainly recommend it. 4.5 starsThis was twelve years in the writing and was rejected by many publishers. It defies easy description and is very much set in the interface between Maori and western culture. There is complexity in the structure and a dose of magic realism at the end. The character of Kerewin Holmes is a remarkable creation who jumps out of the page. The novel revolves around three characters. Kerewin Holmes is a solitary woman living in a tower, a painter who does not paint and who is estranged from her family. Joe is the adoptive father of Simon, a boy washed up on the beach, who isn’t able to speak and who has considerable behavioural problems and no sense of personal property. Joe has relatively recently lost his wife and child and he is now bringing up Simon alone. In this he is struggling and he is physically abusive and violent towards Simon. Hulme is a great storyteller and her descriptions are vivid;''watching the blood sky swell and grow, dyeing the rainclouds ominously, making the far edge of the sea blistered and scarlet''There is a musicality and rhythm to it all; Hulme switches perspectives between her characters and mixes poetry with prose, also mixing English with indigenous Maori language. There are lots of themes. All of the main characters are isolated. A sense of home and family life is often seen as something to be strived for as Simon thinks;“He had endured it all. Whatever they did to him, and however long it was going to take, he could endure it. Provided that at the end he could go home. ……if he can’t go home, he might as well not be. They might as well not be, because they only make sense together. We have to be together. If we are not, we are nothing. We are broken.”Hulme has said that interwoven threads is one of her favourite images in the novel. Hulme has taken two elements of postcolonial literature, language and magic realism and uses them to good effect.One issue that cannot be avoided is the violence by Joe towards Simon. When Hulme writes the violence she strips back the language and makes it very stark. Hulme herself is very clear about why she did this; to address an issue in New Zealand. Hulme has stated that violence towards children was a “pervasive social problem in New Zealand, among Maoris and Pakeha . . . and she had written the bone people in part to draw attention to it” Hulme gives the reader nowhere to go with this; Joe by being violent loses his Maori language and sides with the Pakeha, the western colonizers. His attempt to destroy Simon seems linked to the destruction of Maori culture. His redemption is linked to his rediscovery of his roots and culture. I only found this partially convincing; male violence is male violence, wherever it is found.I must admit that I did struggle with some aspects of the ending, but the writing and language is captivating. 4.5/5A rare mix of characters and languages and emotions indeed. Gripping. Kerewin is one of my all-time favorite characters; she's everything I am and so much more. The talent and the energy and the drive. Simply beautiful. I can't forgive Joe though. I can't. (view spoiler)[I don't see any justification for his violence. Is this how males get? Is this how their logic works? It has no place in society, whatever their excuses and reasoning and past horrific experiences may be. What he did to Simon was unforgivable, and the way the book kept pushing them together was unbearable. No one should go through that much torture and horde the blame for themselves. (hide spoiler)]Moving on though. The story builds and builds and then the ending. Hardly satisfying(view spoiler)[, especially given all the hinting and foreshadowing. It was all too easy, really. A happy family reunion, after all that? Unlikely (hide spoiler)]. The flow of words was nice, I have to admit. The Maori language has a certain running quality that makes the sprinkling through tolerable, almost pleasant, despite the lack of understanding. So, higher than a four, but not a five. I don't agree with all of it. But I can't deny its unique beauty. I out myself as a philistine, I guess, with my dislike of this painfully literary book, which I read only because I was in New Zealand and thought I ought to read a famous NZ author. Once I got past the aggressively defensive introduction (Idiosyncratic Author is idiosyncratic! I can dizzily swap first-person POV and use my own grammar and make up my own words because I am Artistic!) and the Mary-Sueish tinge of the central character being named after the author (*headdesk*), I found this book...confusing. Parts of it were interesting, parts dull, and hey, surprise woo-woo at the end (which I kind of wish had been introduced sooner, because it was cool, and actually, you know, went some where). I didn't particularly like any of the characters, but I suppose that was part of the point. When I recommended this book to my book club several years ago, the only other woman who had read it glared at me and said "if we pick this book, I am going to be REALLY mad at you" and so I withdrew the suggestion. This winner of the Man Booker prize is painful to read. It forces the reader to consider the complexity of human nature and behavior -- how thin the line can be between love and abuse. It is set in New Zealand and is about three wounded and likeable characters - a man, a woman, and a child. The Bone People had been on my to-read shelf for almost a year, so I decided that it was a good first read of 2013. I wanted to like it; indeed, for the first hundred pages or so, I did. The language is unconventional but richly textured and evocative (and exotic to this American boy). This was enough that I didn't notice some major flaws until I was too far in to quit reading. Once I noticed them, however, they were impossible to un-notice.My first problem with the book is that one slowly realizes that Kerewin is a bothersome character. Since she is arguably the most important character, this is an issue. If you've familiar with the mysterious, sometimes scary realm of fan fiction, you'll know the term Mary Sue. Kerewin has got the Mary Sues something bad. The similarity of her name to the author's is only the first clue. She's also fabulously wealthy, talented in art, music, and language, a survivalist, and oh--she can kill a man with her bare hands. In conversation and in monologue, she sounds exactly like someone with all of these traits would sound: that is, she sounds ridiculous. About three quarters of the way though the book, I was wincing every time she opened her mouth. (view spoiler)[ Then there's the child abuse thing. I understand that their relationship is supposed to represent the cultural conflict, but Joe beats the crap out of Simon. Kerewin doesn't like it but doesn't really do much about it. They both let the kid smoke and drink, for cryin' out loud. Joe’s presented in a disturbingly sympathetic light, and we're supposed to be okay with it all at the end, because he finds an ancient god and is redeemed. Yep, that’s right. Actually, everyone finds an ancient god, and all of their troubles vanish. Kerewin’s cancer disappears, and she is reunited with her family. The ending of this book is just chock full of deus ex machina. The last fifty pages creak under the weight of it. Everything is mended between Joe and Simon. They all move in together, and it’s swell. I could overlook the other flaws of the book if it wasn't for this. The characters don't earn their own redemption or suffer because of their own mistakes. The gods fix everything. Maybe it’s a grand metaphor for cultural healing or the power of tradition, but it just doesn’t work. (hide spoiler)]I'm not exactly sorry that I read The Bone People, but I don't think I recommend it. I cannot put my finger on why I love this book. I didn't really think it all that special when I read it, but it has stayed in my mind so vividly when many a lesser book has dissipated from my memory. I think the authors descriptions are understated while being vivid. I read the book years ago and I can still remember clearly descriptions of meals cooked, of the matter-of-fact efficiency the main character displayed in her solitude. All of the characters are overtly flawed, and the author doesn't just skip over that to tell a "happily ever after" story about friendship. Maybe I loved this book because it is not a fairytale. The characters you grow to love and empathize with are also the ones that drink to much and beat their children, or the ones who steal from you after you've generously given them money. These are not the heroes we put next to flags or on films, but they still come across the page as lovable. A very provacative novel. So, okay, Ms. Hulme, I already felt rather suffocated by your novel throughout the book, but you really tried to strangle me with your final chapters. I was going to rate the novel 3 stars. However, after those last chapters, I will now grant it a mere one star plus another one for the rather picturesque writing throughout the book.Let me explain. I rather liked the sing-song quality of the narrative and in particular the inserted little snippets of poetry, contemplations and lamentations. What I truly hated were the two main characters who are just utterly unsympathetic. Hulme’s apparent alter ego, Kerewin, has serious character flaws and feels so elevated from mere humans that she does not want to commit herself in any way, even if a six year old boy, whom she claims to love, is ferociously beaten on several occasions, the last abuse so severe that the boy is within inches of death. She is convinced that the father, her new friend Joe, cares about his adopted son and that should be a sufficient reason to excuse his behaviour and for herself no reason to act in a decisive way. Subsequently, at the end of the book, Hulme seems to insist that her readers accept her idea of the redemption and forgiveness of Joe. It feels to me that she forgets that her readers might feel pretty disgusted by both Kerewin’s and Joe’s earlier pathological behaviour and are not in the mood to forget what transpired before. To help her doubting readers, she introduces sudden magical occurences which result in the elevation of Joe to a moral, even saintly, human being. Sorry, what drivel! Needless to say, I was relieved to finish the book. I read this as part of my self-declared New Zealand November in 2015. It checks of a few boxes for me - Oceania 2015, a Man Booker Prize winner (I'd like to read them all eventually) from 1985, female author, etc. Keri Hulme is also part Maori, which made this a deeper cultural read about the country.From the publisher's description, I was expecting a pretty straight-forward novel: "In a tower on the New Zealand sea lives Kerewin Homes, part Maori, part European, an artist estranged from her art, woman in exile from her family. One night her solitude is disrupted by a visitor – a speechless, mercurial boy named Simon, who tries to steal from her and then repays her with his most precious possession. As Kerewin succumbs to Simon’s feral charms, she also falls under the spell of his Maori foster father Joe, who rescued the boy from a shipwreck and now treats him with an unsettling mixture of tenderness and brutality. "Instead I discovered a book mixing poetry inside of prose, stream of consciousness inside of third-person narrative, rotating points of view inside three unusual minds, and a setting with fantastical elements, sometimes from Maori mythology, sometimes Keriwen's or Simon's own ideas. It was simultaneously easy and complex to read and is unlike anything else I can think of that I've read.It's funny because the only books I can think of that are similar are recent New Zealand reads. I don't think it is a unique experience to New Zealanders where the outsides don't match the insides, but so far that has been a far more prominent theme in New Zealand literature than in any other place of origin. The insides that are unexpected range from artistry to mental illness, abuse to psychopathy. The world is seen both as it is and in an elevated sense, through the lens of myth or a different mind. Why in New Zealand, I wonder? Is the mystical connection to the land just that more recent here of all places? Don't listen to the people who poo-poo this book. It doesn't feel like an Oxford or MFA educated writer musing about their contemporary experience because that isn't who the author is. I am a not overly enthusiastic about this book. Although some parts were beautifully written and engaging, in the end it failed to convince me. The book deals with difficult issues, i,e. inter-familial violence, child abuse and alcoholism. Hulme paints a vivid, realistic picture and the characters (even the abusive stepfather) are not 'black and white'. But the 'hollywood-ending', where all is hopeful and the abusive father is reformed, didn't ring true to me. Still, for readers interested in Maori culture the book might be worthwile. I read this book not long after it's release. I remembered it having a slow start and then building up to a shattering climax.The scenes that had an impact for me still do. This book does a wonderful job of exploring a complex relationship that was both loving & violent. (view spoiler)[ I wish I could say Joe's prison sentence was unrealistically short. But I can't. (hide spoiler)] Some of the prose was quite beautiful & I didn't mind the liberties Hulme took with descriptive words. There are also a few flaws.Kerewin is at least partially autobiographical (the similar names are a little clue!) and I could just feel Hulme's smug approval of Kerewin's actions. Personally I found her insufferable at the start, although she did improve in the middle of the book & I liked the character's honesty about her part in the outcome for Simon.I had forgotten the ending. Was a bit Mills & Boon for me. Thought Hulme wimped out a bit there.Not a masterpiece (Mistresspiece?) but a very fine book & an important part of New Zealand's literary landscape. The ocean was the only song in the book that I enjoyed.That said, it was a fascinating insight, but, like a door you never wished you opened. Hulme is a gifted wordsmith, rich, evocative language that paints a harsh and salt-stained landscape, which really gives a sense of New Zealand's vast wild spaces, also the staggering alcoholism, racial tensions and blithe brutality. . From a strictly objective point of view the story is stunning. Truly. Unfortunately, it is drawn out. Reading about people getting blinding drunk, being stupid, belligerent and abusive-- and then sick, nine of out ten days is not riveting. Reading about a kid being brutally beaten regularly, not a couple slaps or strops of a belt, but broken bones and scars that will never go away physically or emotionally, is depressing.Reading about other people thinking something should be done, and doing nothing, well... that's F#@king infuriating. I have to give some leeway for the fact that this was published in the eighties. While corporal punishment used to be commonplace, thrashing your kids was not. It was never acceptable. There is a mysticism and magical realism employed within the story that blend well with the native Maori beliefs. There is an intense amount of Maori language used, so the index in the back is not a perhaps I'll use it supplemental because unless you understand basic phrases, titles, and terms of endearment then you'll miss significant context. I read this in paperback form so I can not speak to whether or not ebooks have clickable references, but it would be invaluable. Finally, my knowledge of NZ politics and racial issues is nil or near as nil as to be completely useless. Nonetheless, it is obvious within the story how characters are judged on how "Maori" they are from physical looks, to language skills, and beliefs. This is interesting, but it also makes the brutality of Simon, an extraordinarily "white" character disturbing. I haven't read any critiques about this, but it would be interesting to discuss with someone who had greater understanding of the issues. So, the theme really didn't appeal to me. The storytelling itself is beautifully worded if repetitive and drawn-out. The ending, well here's where it fell apart. Unrealistic and vague, as if more palatable closure was needed then either was laid out throughout the story or frankly, deserved by the characters. As much as I love the ocean, I don't want to visit here, again. Betelgeuse, Achenar. Orion. Aquila. Centre the Cross and you have a steady compass. But there's no compass for my disoriented soul, only ever-beckoning ghostlights.In the one sure direction, to the one sure end. The Bone People is, quite simply, the most powerful, moving, stunning book I have ever read. The characters are well drawn. I wanted to hate Joe, but he was in so much pain that I couldn't, really. I never excused what he did - and Hulme did not ask the reader to do that. She challenges the reader to look at our society as a whole; to see what we do to people and how we as communities play a role in creating some of the violent, terrible situations that result in children being abused. I know that some people found that the mysticism in the latter section of the novel took away from the book. I disagree. I found that it fit in well with the story and helped flesh out some of the messages the author was trying to get across. Some of the imagery in this novel is absolutely breathtaking. I have never been so utterly moved and transfixed by a novel as I have by this one. It challenged my perceptions and it made me a different person when I was finished it.The book is quite long, and it can be slow in a few spots. I found that I had to read it twice. I admit I did hate Joe the first time I read the novel; I really only began to understand him the second time I read the book. This is a complex, multi-layered work that speaks to a wide range of issues: child abuse, spirituality, community, and culture. I highly recommend this novel to everyone. You may not like it or agree with it, but you will be impacted by it. It still haunts me today. 3.5 rounded up. I first read this book in the early 90's and I didn't remember that much of the story but I remember living it. This time it was on track to be a 5 star read until I got to the last part and then it just went off the rails for me. Sometimes I really enjoy rereads and sometimes I think they are a terrible idea. Sheet and apricocks what the berloody hell was that? !This is one of the weirdest, most evocatively written and engaging books I’ve read in a very long time. The inventiveness of the language is just staggering. For the first third or so I was completely hooked and thought I’d discovered another all-time favourite, but it missed out on a five-star rating from me because the pace slowed in the middle third and then the final third was frankly just mad.The book is about Kerewin Holmes (the author is called Keri Hulme, geddit? ), a reclusive and wealthy eccentric living in a remote tower on a beach in New Zealand. Kerewin is a phenomenally bright alcoholic, estranged from her family and suffering from crippling artistic block. She wants to paint but just can’t. Into Kerewin’s life wanders Simon P. Gillayley, a scrawny mute boy who infuriates and fascinates her in equal measure. When Simon’s adoptive Maori father Joe arrives to take him back, a special kind of dysfunctional unit forms and Kerewin is drawn in. Kerewin is one of my favourite female protagonists I’ve ever read. She is complex, intelligent and strong in all kinds of ways. The fascinating thing about Kerewin is that she is written in a way that is completely devoid of the male gaze (yes, the author was female, but I find that even female writers tend to write with a male gaze, probably without even noticing). The bizarre way that she thought and spoke drew me in rather than alienating me. In a word, she was unique; I also got the strong impression that she was based on the author in more than just name. But I felt like this was a book of three distinct parts. The beginning was brilliant, fast-paced and intriguing; the middle was a HUGE lull in which nothing really happened; and the end was just truly weird (and left me a bit 'WTF'?! ).There’s an awful lot going on in The Bone People, but in a good way. It would be an interesting one to discuss as a group, even though it certainly wouldn’t be everyone’s cup of tea. I’ll definitely be recommending it to people though. One of my all-time favourites. A quirky book, very New Zealand - they produce some....unusual books and films here. The national psyche here is...bleaker - and darker - than would perhaps appear to the observer. At least, that is true if you look at the creative output with my (jaded?) eye!If you would like to see what I mean, watch 'The Piano', 'Once Were Warriors' and 'Whale Rider' - which last is not so much dark as steeped in 'otherness'. This novel speaks so clearly to me of the New Zealand psyche that I put it forward as archetypal of this country, this nation. This was a very difficult read for me. There are a few reasons for this but chiefly it is because this story is devastating. We have a bizarre world and narrative to wade through, limericks and soliloquies, mysticism, maori history (and language) all combined with insanity. Three main characters who are out of their minds. Put this all together and a fresh, quirky story could be delivered but that's not what happened here. All of this was injected into the very real and horrifying reality of child abuse. Between all the weird sidebars and references to new zealand flora and fauna there are two people who fall into the gray middle area that life truly is. Joe, in particular, is likable. He's the life of the party, he's emotional, funny, caring and of course there were times when I found myself longing for the obvious love story. And that jolts me. He beats his son. Physically this boy is broken, emotionally he is caught up in the abusive cycle, instigating his own beatings to get to the make up happy again part. For entertainment, when I sit with a book I've realized there has come to be an expectation of clear boundaries, protagonists and antagonists, the crisis and the resolution. Rarely in life are there actually people who can be defined as evil or good as they are in books and cinema. But it is relaxing to the mind to get to know a character and file them away in the nice or naughty folders. In real life, child abusers are people not archetypes. And in The Bone People, a horrifyingly real situation plays out and all the reader can do is sit there, aghast and depressed. At times the garble/poem-speak would cloud out the events and I would have to go back and make sure I was understanding correctly.... it certainly made the story-telling unique but in some ways it disrespected the story that needed to be clearly told for Simon/Haimona/Claire. I did not like the story arc and I did not like the ending. I went back and forth, rapidly turning pages to putting the book down for days (read:weeks) because it was just too damn much, too frustrating, too painful and, frankly, too long. I did not like diluted moral of the story either. I mean, when I arrived at the last page I felt boggled. Am I supposed to feel happy? Relieved? Am I to think we have a reformed man here, changed by the grace of a gemstone, who is not going to beat his child anymore and will live happily ever after with his not-so-depressed anymore miraculous cancer survivor girlfriend? I'm going to save the rest of my thoughts for book club discussion and hopefully put more order to them in the process. This was my second time of reading The Bone People. I remember loving it the first time around, but I also remember thinking that it was flawed in many little ways (the very beginning, the sketchy end, the way the story's strands seem to escape Keri Hulme in the last third) yet whenever I've stumbled upon it on GR I kept being surprised at my 4*rating, since there's many five* reads that I remember much less and that had less of an emotional impact on me. I think this time I've surrendered to my gut which told me that this book might be like my bookshelf. I love it dearly, self-built as it is, but it isn't really what anyone would call a neatly build shelf. Yet I would sing it's praise (the book's and the shelf's) at every chance that I get.Hulme is a wonderful storyteller and her language - though odd at times - is very powerful.One of the things that most impressed me about this book is the warmth Keri Hulme has for her deeply damaged characters, without ever using the soft-focus-lens on their actions. It left me in an interesting grey area as a reader quite often, being repulsed by / in love with these people in equal measures.I'd recommend it highly to anyone who's interested in literature from and about New Zealand and in following the journey of three emotional shipwrecks (often odd and beautiful, sometimes odd and hard to stomache) in a story that has one foot in New Zealand-Realism and the other deep in Maori-Symbolism. I have a feeling this book is going to haunt me for a very long time. Given that, I should bump my rating up a little higher. Except...... the writing style was very different from anything I've read before. I did get the hang of it eventually except that I was confused by the Mauri language (in spite of the dictionary at the back) and the symbolism.The themes of alcoholism and child abuse were disturbing. The characters weren't all that likeable, and yet, in some strange way, I grew to like them in all their flaws.I thought the ending was a bit unclear. It wasn't wrapped up with a neat tidy bow, even though it appeared to be. Either the ending was weak, or it was intentionally written that way to keep the reader guessing. What a strange style Hulme has used to present her story. It took me probably 15 or 20 pages to figure out how to read this book. But once it opened for me--wow! By page 34, I love both Kerewin (artist (estranged from her art), exile (from her family), dislikes people, especially children) and Simon (the child, naturally, speechless, which is less expected). By the half-way point Hulme has moved away from the sunny view of "cranky loner woman falls in love with strange child and all is happy." No, as beautiful as that was, there is much more to the story. The child is abused, big time. Kerewin comes to know who is the abuser, has to figure out what, if anything, to do. Remember, she is not fond of children in the first place, and now she's fallen into this huge responsibility. As more and more is revealed to the reader, she also begins to feel responsible. And then she, the reader, comes to see some of this through the eyes of the abuser, who is actually a human being, in addition to being a monster. It becomes very hard reading. It's hard to read and even harder to put down!And then the monster does the unthinkable. Kerewin surely caries some of the responsibility/guilt, if none of the blame. It's horrible, just horrible. And it's clearly the end of their story. But there are well over 100 pages to go, so where and how?The book takes off in a totally unexpected direction. I'm not sure the rest of the tale and the ending are satisfying or that they are not. It reminds me of one of Rushdie's books, the one that got him in so much trouble; near the end he (by way of a character) decided that, after all, nothing in unforgivable. I remember questioning that then. I question it still. i loved this book so much! i don't know why it's taken me so long to write this post, since i've been wanting to rave about the book since i finished it. i was a bit dubious when i read the introductory note about it having non-standard grammar etc, but it was so good! i think i even liked it enough to kick cryptonomicon off my literary speed dating list, except that i don't think it would create the right impression... the language is beautiful and the characters are wonderfully real and complex. i was worrying about them even while i wasn't actually reading it. their speech patterns started incorporating themselves into my inner voice as i read, too (i still keep finding myself thinking "e (name)" and "berloody"). phantom mentioned the book in a comment to my post about asexuality as an example of a character who wanted "love and human connections" without being sexual (thanks phantom!). i actually found myself identifying more at times with simon, the kid who doesn't talk (although he was far more expressive with sign language and writing than i ever am), especially in the scene where he realises kerewin has heard him singing and he's terrified of what the consequences might be. the three main characters' inner voices are written so well that i couldn't help feeling for all of them as they worked through the misunderstandings to negotiate their relationships. i'm not sure i could read it again too soon, since it is rather disturbing and heart wrenching, but as alice walker's blurb on the cover says: "this book is just amazingly, wondrously great". Read this for Intro English my freshman year and recently re-read it. 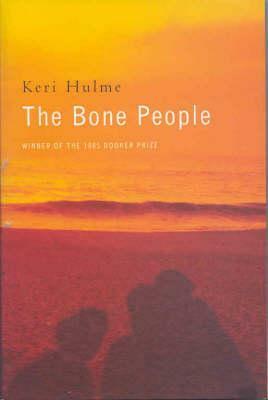 The book centers around three main characters, but their relationship with one another is best left up to the reader to determine as the story unfolds.Hulme is a self-identified bicultural writer, which makes The Bone People a bicultural text, incorporating both Maori and Pakeha influences within the New Zealand setting. According to my professor: "One of Hulme's high school teachers, responding to her writing, told her her writing was 'far to rich,' that she used 'far too many adjectives,' which the teacher claimed was Hulme's 'Maori side...coming out.'" It is because of her bicultural identiy that the conventions of the archetypal genre are transformed. The writing is enhanced by Hulme's abundant descriptions. This poetic quality is unusual, but represents a cultural quality of Maori language. Though this makes the book dense and often confusing, it creates a pleasing effect overall. Hulme is not just challenging the traditional form of the novel. Rather, she is helping to modify the way in which her culture approaches literature in general. I don't hate it. Therefore, the two stars.I do wish I understood it. I am sure that this story was written about three people and a culture I do not understand.It was an interesting experiment in a writing style all the author's own. It was just too vague and cryptic for me to appreciate. 3.5 starsI wanted to like this one much more than I ultimately did. It oozes with the mystic and aura that is New Zealand; there are some really lovely poetic passages and most of the characters are well thought out and executed. Maybe it is that note – most of the characters; maybe it was the occasional intrusive Maori word or statement that didn’t feature in the glossary and couldn’t be gleaned from the other statements around it?I shall deal with the negative, so I can end with the positive. I hated Kerewin Holmes. The fact that she was too close to having the name of our writer has little to do with it; rather I found her an amazing proficient at everything except human relationships, just a tad too boring after a while. She can build a tower & repair a boat: she is the most amazing angler the world has ever seen: her Asian martial arts are of Olympic standard: a Royal Academy worthy painter: fluent in three languages: reader & reciter of every philosophical book ever written; and so the list goes on. However, in the glossary, we describe one species of fish as very good eating – I would rather have found out which group it belonged to. It came to my mind that Hulme had devoured a Pears Encyclopaedia as a child (probably the only book in the house) and she wanted to show off her erudition. Instead, it grated. Sadly, Kerewin is in your face for most of the pages, and you can’t get away from her smug self. No wonder she is disassociated from her family, as a sibling, I would have told her to sod off years ago. It also felt a little uncomfortable, but not totally absurd that this sensual woman was a virgin.Joe and Simon, have a very believable relationship & I shall mention that later; however, the apotheosis and resolution Joe experiences beggars belief. I enjoyed and accepted the mystic realism of the old man on the beach (As I said, New Zealand & its ambience, cultivates this mysticism), but I couldn’t see the complete turn around of behavioural patterns implied by the ending. Oh, and that awful ending – very much like “and they all lived together very happily in the little green cottage at the end of Tinky Woo Lane”.Finally, the religious overtones of the triumvate were laid on a little thick. I forgave Hulme as this was her 1st book. Surely she won’t do a resurrection, I thought. A block of pages later (eyes veiled): No, she is doing a resurrection! So- it would have ended grimmer but more honest to the true subject matter if Simon had died; Kerewin died of cancer, and Joe, after release from gaol had lived in a little hut after meeting the old man. But, this was not to be.The positive. Well, this is the aspect that a number of reviewers have found confronting and gave such low scores: namely the child abuse. Abusive relationships are rarely themes in novels and if they are, are romanticised or used a vehicle for a crime novel. Here, we get the emotional side. It is presented honestly, brutally but also highlighting the love that surrounds it. Not a nice love, but the fact is: strong, emotional love can be coupled with physical abuse. I believed that Joe felt strongly for Simon, but was frustrated by his wilfulness and anger. Reciprocally, Simon provokes his father, and receives the response he desires. He covets both the beatings and the hugs. He is emotionally mixed up and confused, so yes, he does attack his father with a glass shard, but the question needs to be asked: why provoke your father to hit you, if you aren’t getting something out of it? This is beyond the book’s scope or my review, but it is worthy of thought.We have these emotionally broken people interacting and failing and trying to do the best with their inadequate emotional tools they have acquired. Isn’t this a slice of life? Isn’t this typical of the lower economic society? So, it is great to see it dealt with in a compassionate and honest way. It is such a shame we had to have that “tool” of a woman being an overbearing know-it-all. Just toning that aspect down would make this a 5-starer for me. The story and the characters are amazing. The combination of dialogue and interior monologue helps carry the story with a minimum of narration. I like that.This book is more of a 4.5 stars, but it didn't rate the whole 5 because the ending was all wrapped up in a bow. All through the book I'm led slowly and there's mystery surrounding the three major characters. Then--boom! Fairy tale. You know those books that you finish thinking that it was alright, but as time goes on and your mind mulls it over you begin to like it more and more? The Bone People is the opposite kind of book, to the extent that coming back to write this review I was surprised to find I had given it two stars instead of one.Where to begin with this terrible attempt at a novel? Well, the opening of poems and snippets of disjointed text without context served as a confusing start to the book, and even once you return to it after finishing the book and knowing what is going on it's needlessly opaque. In general the structure of the book is a mess, with the first two-thirds of the book being an almost completely realistic depiction of life before switching over in the final third to a story replete with the supernatural. Jarring, to say the least. Additionally, this book is far longer than it needed to be, and a properly aggressive editor would likely have shaved off at least a hundred pages.Beyond the structure the content is also painfully bad. The main character, Holmes, is a bizarre insert of the author that is a rich, brilliant artist who is also a martial arts master. Sure she laments at times about her lack of connection to other people, but the book paints this as Holmes being too cool for everyone else more than an actual inability to be social with other people. She feels like a edgier attempt at a Mary-Sue, and at times I cringed while reading the parts of the book focusing on her.She's not the main problem, however, as the character of Joe and the book's attitude toward his actions fills that role. It is revealed somewhere at around the halfway mark that Joe is being abusive toward his adopted son Simon, the third main character. We're talking beatings that put Simon's life in danger. The book still treats Joe as a sympathetic character despite this, even when Joe's beatings put Simon in the hospital and bring him within a hair's breadth of death. Hulme is on record as saying she wanted to write about the issue of child abuse when she wrote The Bone People. Someone needs to tell her that writing about an issue is more than just including an instance of that issue happening in your book, you also have to explore the effect of that message or take a stand on that issue. I'm assuming she didn't intend to do either, because the end of the novel appears to preach that child abuse isn't that bad and that being around an abusive adult is a good option so long as he claims to care. At the end of the story Simon is desperate to return to Joe, his abuser, and in general the novel takes the approach that by removing the child from his care the government was making a mistake, as they just "didn't understand the relationship the two had. "Such a message is disgusting. I'm going to give Hulme the benefit of the doubt and assume she's merely an incompetent writer, instead of evil.